Approaching the mysteries of faith: a contemplation on how to approach the mystery of the Incarnation. Sharing my Orthodox thoughts on matters that we face in our daily lives through writings and blogs. Science researches, investigates, observes and concludes. If we want to plant, we start with a seed, place it in soil, water it, and wait for a period of time until a small plant emerges. Inside the seed, there is a tiny plant with its nutrition, and when this tiny plant grows, it breaks through the shell and latches onto the soil. It then receives nutrition and water from the soil, and finally grows into a full plant. We observe the process, and we might even say that we understand how it works, but we do not know why it works this way. We call this growth process germination. We accept it, and even modify it, but there are basic elements in this process that we can’t change. We simply have to accept them. Here we see Archangel Gabriel explaining to St. Mary how she will conceive, but it is still a mystery and a difficult matter to grasp, so he adds, “Elizabeth your relative has also conceived a son in her old age.” For St. Mary, this isn’t an answer to the question of how, but it is another mystery for St. Mary to observe that will help her accept the mystery of her conception through the Holy Spirit. Going back to our introduction about planting, observing the germination process of roses and tulips, for example, can help us accept and expect the same process for lilies. 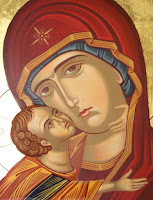 The same is true of what is offered to St. Mary and to all of us; by seeing Elizabeth, who was barren and of old age, becoming pregnant, we come to accept the mystery of the conception by the Holy Spirit a bit more. Archangel Gabriel offered the Theotokos, and all of us, another wonder to contemplate, which can help us accept the mystery of the Immaculate Conception. Hence, we approach the mysteries of faith in faith. We approach the mystery of the Immaculate Conception with the help of other wonders and miracles, but we must accept it in faith. St. Elizabeth’s conception of St. John the Baptist at that time was miraculous. There was no other explanation, such as scientific intervention, except for true divine intervention. Based on the approach that the Archangel Gabriel used with St. Mary, urging her to contemplate and ponder on Elizabeth’s pregnancy, we too contemplate and ponder on other wonders around us to accept the mysteries of faith. “And without controversy, great is the mystery of godliness, God was manifested in the flesh” 1 Tim 3:16. Here, St. Paul calls it a great mystery of godliness, that God was manifested in the flesh; however, the church fathers spoke of the revelation or the manifestation of the mystery. For example, we hear Theodoret of Cyrus saying, “The mystery is the sacred object of reverence, namely, that what was foreordained from the beginning and afterward became manifest”. We are not to understand the use of the words manifestation or revelation in the writing of St. Theodoret to mean that we came to understand the mystery of Incarnation or the Immaculate Conception; instead, we understand the word “manifest” in St. Theodoret to mean that what was promised came, in time. From the above, we can also conclude that the mystery, although augmented, is not understood, and remains a mystery. Although it was prefigured by many signs and foretold by many utterances, it remains a mystery. It is not random; it has been planned since the beginning of creation, yet remains a mystery. In defending Christianity against the Gnostic heresy, St. John the Beloved, in his first epistle, emphasized that he had heard, seen, and looked upon the Word of Life. St. John saw the need to mention that he bears witness to this mystery and that he declares this mystery to us. The mystery of the Immaculate Conception and the mystery of the Incarnation are more mysterious by the Lord taking to Himself what is not according to His nature. That God was manifested in the flesh, that the light shone in the darkness, the Life tasted death and all such declarations which the apostles made. These increase the marvelous character of Him who manifested the super abundance of His power by means external to His own nature. By the Lord taking to Himself what is not according to His divine nature, the mystery of the Incarnation has become even more mysterious. Although the Son of God manifested Himself, was touched, heard and seen, grew tired, was hungry and thirsty, all of this made this mystery even more mysterious. Having said all that, we can’t look into the Lord’s Conception and Incarnation with blind faith, but with faith enlightened. While Moses was tending the flock of his father-in-law, he saw that the bush was burning with fire, but wasn’t consumed. He approached to see this great sight, wondering why the bush wasn’t burning (Exodus 3). This is exactly how we approach the great mystery of the Immaculate Conception. For Moses, it was a great wonder and he was perplexed by what he saw. For us, our minds wonder at the great mystery of the Immaculate Conception, and all the other mysteries of faith. There is an important point that we should consider: in God’s conversation with Moses about the exile, which would be filled with wonders, He didn’t leave Moses without evidence. When Moses asked for signs, he was given signs about the wonders that God would perform. Moses was given the sign of the staff turning into a serpent and then reverting back. Then he was given the sign of his hand turning white because of leprosy and then changing back. These signs would support him in believing the wonders performed during the ten plagues. 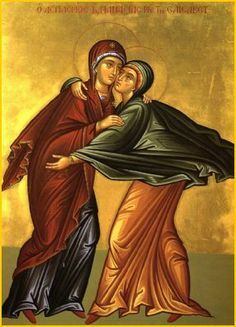 Going back to the conversation between the Archangel Gabriel and the Holy Theotokos, St. Mary, the angel didn’t leave her without evidence, but gave her the evidence found in Elizabeth. For us, even in the mysteries of the Immaculate Conception and the Incarnation, we are guided by the birth of a child from a barren woman in the Old Testament, and of course by the birth of John the Baptist from St. Elizabeth. Our faith is a mystery, but it is supported by evidence. The Lord invited the two disciples of John the Baptist to “come and see”, an invitation not only to believe, but also to investigate. When we speak of mystery, we are not speaking of blind faith; we are speaking of faith that is supported with evidence, yet approached as a mystery. How can we approach the mysteries? 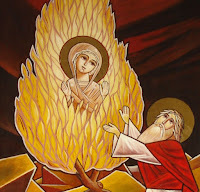 If we go to the scene of the burning bush in Exodus 3, we see, in the words of Moses, “I will turn aside and see this great sight why the bush doesn’t burn”, the voice of one who is not only coming closer physically, but according to the church fathers, also moving upwards towards heaven. Turning aside, signifying turning away from where he is at; turning towards this divine revelation. The following words, “take your sandals off your feet”, emphasize this. These words combined mean that if you, Moses, want to approach divine sights, then you need to turn aside and leave worldly matters behind. That is precisely my main point: if we want to approach the mysteries of faith, we can only approach them when we are ready to turn aside and take off our sandals, which means everything that may be corrupting our lives. Only then will our hearts open to understand those mysteries, not with our minds, but with our hearts. 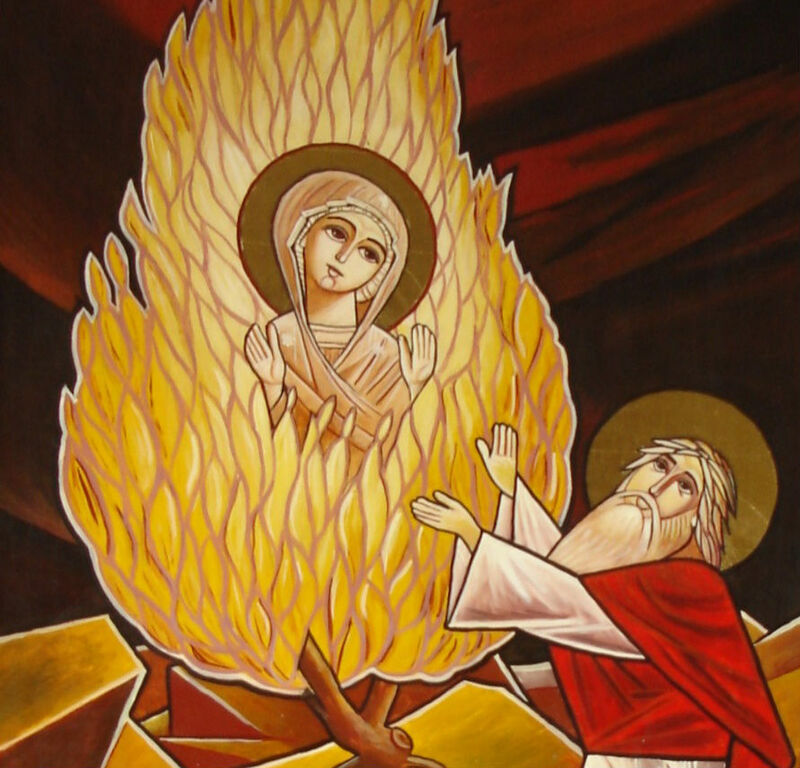 Only then will we join Moses in accepting the mystery of the burning bush. Only then will our concern not be about evidence, but about the indwelling of the Son of God in our hearts. The mysteries of faith will remain mysteries to our minds, but they will find their place in our hearts; our faith will be in confidence. 1-The mysteries of faith will remain mysteries; having evidence is a great support, but we must receive them through faith. 2-Other mysteries in our lives and in the lives of others give witness and help us to receive and accept the mysteries of faith and the mysteries in our lives. 3-For us to approach the mysteries of faith, we need to leave worldly matters behind. 4-This isn’t a matter of theology that is very distant from our lives, but rather an idea that will assist us every day. When we struggle to accept God’s will, we should look into our history with God, or rather, God’s history with us and His history with others. We should contemplate and ponder on His miraculous working in our lives and in the lives of others. We should pray to accept His will and expect a miracle that is specially designed, timed and planned for us. At that point, we might see that the miracle in our life was foretold by signs and wonders that we might have ignored or couldn’t understand at the time. People have different perceptions of the church. Some claim it is a hospital for the sick, while others, in the early centuries of the church, declared it was a resort for the saints. Some claim that the church should be a comfortable place, while others argue comfort isn’t a concern at all. Yet others claim that the most important element of the church is its creed and that all other factors are irrelevant. Paul, in his first letter to Timothy, describes the church as “the pillar and ground of the truth” since she supports and raises the truth. In very confused and disturbed times like we live in now, one ought to define what truth is. Philosophically, one would argue whether the truth is subjective or objective. If one claims that the truth is subjective, then this very fact—that the truth is subjective—is in itself subjective, which leaves room for the truth to be objective. If the truth is objective, then it has to always be valid. Father Makary Abd-Allah, Ph.D., the only Coptic priest who taught at a university as a priest, departed in the hope of resurrection. As a young man, Adeeb Abd-Allah was the model of a Christian young man who was successful in his spiritual life as well as his secular life. 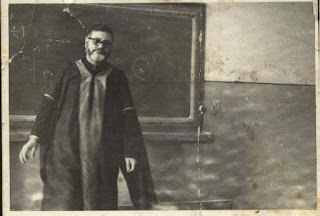 He joined the School of Science, Department of Mathematics, Cairo University. As the top of his class, he was hired as a teacher assistant. He then traveled to Germany to earn a Ph.D. from the University of Gottingen in mathematics in the subject of several complex variables in 1962. He was hired by Cairo University as a professor in 1962. He then earned a national award in mathematics in 1968 and the Highest Achievement Science Medal in 1970. He had a close relationship with Pope Kirollos VI, who approached him to ordain him as a priest. My name is Fr. David Elias a Coptic Orthodox priest at St. Mary and St. Athanasius Coptic Orthodox Church, Northridge, Ca. I have a Master degree in project management, interested in theological studies, love reading and writing. I have deep love to theological studies, always reflecting the writings of the early church fathers and their application on our times now. This is my blog space to share my thoughts regarding matters we face in our daily lives or simply just my spiritual contemplations.